What are the Best Online Certificate in Web Design & Development Programs? What Else Can I Expect From an Online Certificate in Web Design & Development Program? What Can I Do With a Web Design & Development Diploma? More than ever before, businesses and organizations are turning to the internet to power their products and advertise their services, and the demand for skilled web developers keeps growing. Corporations, nonprofit organizations, and governments are always in need of trained developers to build and maintain websites, mobile apps, and ecommerce sites. This field is growing so rapidly that the U.S. Bureau of Labor Statistics projects an astronomical 27% increase in web developer jobs through 2024. If you have an interest in web development and design, you should consider earning a certificate in web design online. A certificate can get you in the door at a major corporation, or enable you to pursue your own creative, entrepreneurial endeavors. Aspiring web designers and developers can earn professional credentials in one year through Bismarck's online certificate in web page development and design. The program can stand on its own or count toward an applied associate degree in web development and design. The 30-hour curriculum packs an impressive array of marketable skills into two semesters. Students can expect to gain expertise in HTML 5, PHP, Java, CSS3, jQuery, AJAX, and XML. Courses explore current software including Dreamweaver, Illustrator, Photoshop, and InDesign. Throughout the program, students develop advanced internet research techniques. All classes can be completed entirely online. Potential students should be aware that Adobe Creative Cloud software is required for two classes and is not provided by the university. Full-time students in this program may be eligible for the Chesak Family Scholarship program. This scholarship awards up to $1,000 to freshmen enrolled in full-time study in one of five selected majors. Aspiring web designers can earn an online certificate in web development in two semesters at Webster University. The university's 21-hour program, which also serves as a standalone minor, prepares students for roles designing and deploying user-centric websites. Graduates will be equipped to design websites in the commercial market, as well as create other software that requires interactive graphic user interfaces. Webster's certificate in web design emphasizes basic design principles, encouraging students to develop their artistic skills along with advanced technical abilities. Students can expect to gain proficiency in scripting, usability, style sheets, and advanced programming. Participants who are already proficient in HTML may opt to explore animation, mobile web design, web editors, or web technology principles. All online courses include hands-on experience with real world sites. Rappahannock Community College’s online web design certificate is designed for aspiring designers and business owners who need to promote their services. This certificate in web design online begins with the fundamentals of HTML. Students gain a working knowledge of website design, construction, and management methods. Students also explore interactive digital graphics, including color and layout elements. Later in the program, this knowledge is put to use as students create cross-platform, low-bandwidth animations. Finally, students examine usability, accessibility, and optimization of web pages on mobile devices. This 12-hour program is intended for full time students. Distance learning at RCC is asynchronous and classes are delivered on a semester calendar. The college encourages incoming students to apply for grants and scholarships that are available through its privately endowed foundation. Champlain College offers a well-rounded certificate in web design online. This 15-hour program emphasizes creative skills as much as technical proficiency. Graduates are able to address the needs of both the business behind the website and the individual using the site. This program's exclusively online curriculum explains the mechanics of web design, including styles, architecture, and programming. Students explore digital images and digital design in greater detail using popular image-editing software. Unlike many similar programs, Champlain also focuses on writing for the web, covering proper voice, delivery, and search engine optimization. Finally, students conduct a feasibility study, a needs analysis, and a project proposal. Distance learning at Champlain College is completely asynchronous. Online classes are deployed in either seven-week or 15-week blocks, and follow a semester calendar. The school is military friendly and employs designated staff to assist servicemembers and veterans with enrollment. This community college's 30-hour certificate in web design takes a practical approach to the business side of website design. Program participants develop expertise with state-of-the-art tools and gain working knowledge of industry standard processes. The curriculum is designed to teach students both technical expertise and business acumen. After fundamental instruction on HTML, CSS, Java, CMS systems, Photoshop, and popular design software, courses delve into e-commerce. Students explore online business strategies, payment gateways, marketing angles, and search engine optimization. The program also emphasizes usability and interface design. M State is a military friendly school. Credit for prior learning may apply to some courses. A full-time student can complete this certificate in one year, while a part time student may take four semesters to finish. Future web designers who lack technological proficiency may be interested in Riverland's online certificate in web development. Designed for students with minimal computer skills, this 30-hour certificate in web page design starts with instruction in the basics of computing. The program's curriculum also includes courses in design, digital editing, animation, and database management. Students develop expertise with industry standard tools like Dreamweaver, Flash, Photoshop, Director, Premiere, and ActionScript. Other coursework explores digital video, social media, and mobile web technology. Over the course of the program, students must create and deploy websites that meet industry standards. Students must also create and launch an online video game. These projects can be used to create a professional portfolio. Upon completion of the program, graduates are eligible for World Organization of Webmasters professional certification. The program is delivered wholly online and study is asynchronous. A full time student can expect to complete this certificate program in two semesters. Currently employed professionals in the tech industry are an ideal fit for Georgia Northwestern's online certificate program in website development. Students who have some technological training can boost their career mobility by completing this 35-hour program. The curriculum heavily emphasizes advanced technical skills. Graduates are prepared for freelance work as web designers, website managers, and developers. In exclusively online courses, students gain expertise in graphic design for the web, XHTML, scripting, and database-driven content management. Classes also cover multiple programming languages, mobile computing, and web project management. Classes are delivered asynchronously on a semester calendar. Full-time students can expect to complete this program in two semesters. The college participates in the Work Innovation and Opportunity Act Program, a federally funded initiative aimed at unemployed or low-income students. Eligible applicants may receive funds to apply toward tuition, books, or related expenses like child care. Southeastern Technical College’s online diploma in website design and development provides a comprehensive education in technical and programming skills. Potential web designers who complete this 57-hour diploma program are qualified for immediate entry-level employment as website designers or developers. The program's curriculum is based on a 36-hour core of upper-division classes in web development fundamentals. Students thoroughly explore program design, scripting, graphics, security, project management, programming languages, and databases. Students may also opt to round out their studies with electives in other computer science courses. This diploma program is designed to be completed over four to five semesters. Students can begin at any point during the calendar year. Online learning at STC is completely asynchronous; however, all distance learners are expected to either attend campus or arrange for a proctor once per semester. Moraine Park Technical College offers an online certificate in web design that prepares graduates for entry-level marketing positions in large and small businesses. The part-time website coordinator certificate consists of five classes. Students will develop proficiency with industry standard software as they master technical skills like image editing, graphics animation, and photo optimization. Instruction focuses on coding with HTML and CSS. Students use knowledge gained in this program to design and build a complete working website. The curriculum prepares students for roles in business by teaching them skills in budgeting, project management, data analysis, and presentation. Upon completion of the program, students who wish to continue their studies can apply these credits to MPTC's diploma program in web design and development. Mesa Community College’s certificate in web design online is an offshoot of its associate program in web technology. This 19-hour program takes one year to complete. Upon completion of the program, graduates are eligible to sit for the Certified Internet Web (CIW) Associate exam. Students in this program learn best practices in Animate, Photoshop, and Dreamweaver. These courses also prepare students for additional certifications in Adobe products. Students will learn about business practices relevant to web design, web publishing, e-commerce, network infrastructure, and security protocols. MCC offers its online certificate in web development fully online. Students who live near MCC may also be interested in a hybrid option that allows them to attend labs on campus. Future web designers can earn a customized certificate in web design online at Laramie County Community College. This 18-hour diploma in web design emphasizes development of technical skills. Students can choose either an e-commerce or promotional business track. Students spend the first semester in courses that cover functional knowledge of HTML, CSS, tables and templates, layout and design, and industry standard software. In the second semester, students focus on their chosen specialty track. In both areas, classes begin by evaluating existing sites and developing improvement proposals. Ultimately, students design and launch original sites that meet industry standards. Program participants begin building their portfolio with websites they create during these courses. If graduates wish to further their studies, they can enroll in LCCC's associate degree program in computer information systems. 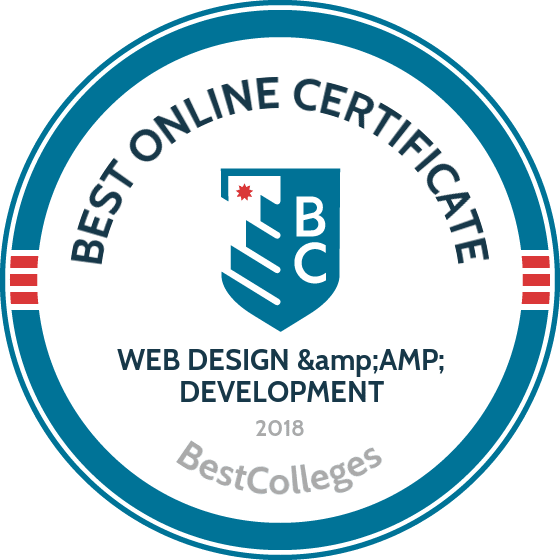 Aesthetics and technical proficiency carry equal weight in the Community College of Vermont’s certificate in web design online. This 27 hour program begins with the fundamentals of web development, including tools and techniques to manage sites, measure their behavior, and present content. Students then build on this knowledge with upper-division coursework in advanced programming. Class topics include programming in Java, principles of animation, and the methodology and ethics of image manipulation. Students develop their artistic abilities through courses in two-dimensional design and color theory. Throughout the program, students build a professional portfolio illustrating their work. Distance learning at CCV is completely asynchronous and follows a semester calendar. A full time student can expect to complete this certificate program in two semesters. The college is military friendly and welcomes service members and their families. Credits may be awarded for prior learning experiences in the military or other qualifying personal history. Specific coursework varies depending on the school you choose for your online certificate in web development. However, most programs offer similar curricula and teach the same core concepts. A list of some common web design and development courses can be found below. Designing Digital Images for the Web: This course teaches students the basic skills they need to design and create graphics for webpages. Students learn to build attractive buttons, backgrounds, text, menus, and other common web images, while also acquiring experience using photo editing software to alter images for use on the web. Web Page Development I - HTML: Courses in web development instruct students in the the fundamental concepts and techniques necessary to build websites. Students learn how to use HTML and CSS code to style and structure tables, images, video, and forms. Through this course, students gain hands-on experience designing websites that are interactive, useful, and easy to navigate. Electronic Commerce: This course introduces students to the processes of generating revenue online, including through auctions and marketing. Students also learn about internet security issues and the impacts of electronic commerce on the world economy. This course is useful for students who wish to pursue online marketing or other online business ventures. Intro to Mobile Applications Development: This course teaches students the basic skills they need to program mobile apps. Students learn to use software development kits to build apps for all major mobile platforms. The course also includes topics on native apps (apps developed for a specific platform) and web apps (apps that run in a web browser). HOW LONG DOES IT TAKE TO GET AN ONLINE CERTIFICATE IN WEB DESIGN & DEVELOPMENT? There are many factors that affect the length of an online certificate in web development program. Since programs vary in their breadth and depth, some programs cover more ground than others. For example, whereas some programs require only five courses, others require close to 20. Because of these differences, some certificates can be completed in one semester, while others require four or five semesters. The program you choose depends heavily on your interests, career aspirations, and time constraints. In addition, the time needed to complete a program depends on whether it is an individually paced or cohort learning program. Programs offered at an individual pace allow students to complete courses at whatever speed they prefer. Students can choose an accelerated path or take their time. Cohort learning, by contrast, requires online students to earn a certificate at the same pace as on-campus students or other online learners. In cohort learning programs, there is less opportunity to advance quickly according to your own needs and abilities. A certificate in web design and development program is generally cheaper and shorter than a bachelor's or associate degree program in the same field. A certificate shows employers that you have a certain skillset, which can help jumpstart your career. A degree, however, may open the door to more advanced positions in the field. Today, every business and organization has a web presence, and they all need skilled developers to build and maintain their websites. This means earning a certificate in web design online can lead to a career in nearly any industry. In addition, depending on your specific interests, you can choose to specialize in the technical or creative side of web development. In a corporate setting, web developers commonly work in teams, but many work as freelancers or consultants. Web developers program the backbone of websites, making sure everything functions properly and efficiently. They are sometimes responsible for maintaining a website after it is already built. Web designers use many of the same skills that developers use, but they focus more on the appearance of a website than its functionality. A web designer's job is to build graphic elements that make the website visually appealing. Webmasters use all the skills needed for web development and design to keep a company's website up and running. They are responsible for site maintenance, updates, and sometimes security. After completing a certificate in web design online, some students choose to transfer to an associate or bachelor's degree program. Earning a degree in web development or a related field can deepen your knowledge of web design and give a huge boost to your income down the road. For example, most senior web developers hold bachelor's degrees and earn more than $85,000 on average. Degree holders generally advance much faster than certificate holders, and can work in a wider variety of fields. Bachelor's in Web Development: Students in this program build on their certificate knowledge by taking courses on programming, database management, and systems administration. This degree can help students refine their web development skills and put them on a path to managing a team of developers. Bachelor's in Computer Science: Computer science students learn how to use programming languages to solve problems and complete complicated tasks. Computer science programs also teach students how to understand algorithms and analyze large amounts of data. Bachelor's in Software Engineering: Software engineering programs focus less on the theory of computer science and more on how to put it to use. Software engineering students learn to create useful products and solve real-world challenges through programming. It is essential to make sure a school has proper accreditation before applying to one of its programs. Online certificate in web development programs are no exception to this rule. If a school is accredited, you can rest assured that it meets recognized academic standards and that you can transfer credits to other accredited schools. Plus, employers are much more likely to hire you if you have a certificate from an accredited college. There are two main types of accreditation: national and regional. You will find that most accredited schools offering professional certificates and vocational training will be nationally accredited. Traditional four-year universities that are research or liberal arts institutions are normally regionally accredited. Whatever school you choose to apply to, make sure that it appears on the Council for Higher Education Accreditation's list of accredited colleges and universities. For web design and development certificates, you can also check that the school's program is accredited by ABET. Higher education can be very expensive. Fortunately, there are plenty of financial aid options that can help you pay for school. Be sure to fill out the Free Application for Federal Student Aid (FAFSA) to determine your eligibility for grants, scholarships, loans, and work-study awards. The federal government offers low-interest loans for some certificate and diploma programs. You can also keep an eye out for private scholarships, as there are plenty of options for web development and design students.